What an affirming, empowering viewpoint! From personal experience, I know it to be a very effective guide to leading, empower, and managing others. Gen. Smith is currently the Secretary of the Medal of Honor Foundation and a noted speaker and author on Leadership. His military career spanned three decades and included several stints on the faculty of the Air Force Academy, 150 missions as an F-4 pilot during the Vietnam war, Commandant of the National War College, and various other leadership posts. His final active duty post was as Air Force Director of Strategic Planning. He knows leadership! What do you think? How about trying Perry’s approach to empowering your people? You might just be pleasently surprised! Learning to manage others is at the heart of becoming a successful supervisor and, frankly, it has very little to do with filling out an annual performance appraisal form. Effective management is the cumulative result of your daily interactions with those you supervise. And that is where real leadership in management is demonstrated every day. Ultimately, you aren’t going to be able to lead your team effectively unless you’re adept at managing the performance of the people you supervise. What do you think? 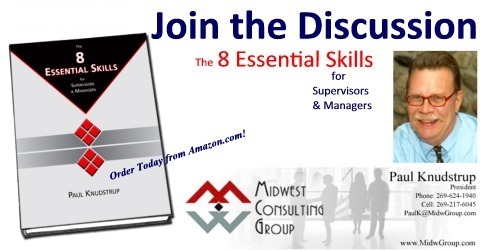 Of the 8 Essential Skills this one – Managing Others has to be part and parcel of being an effective supervisor and manager. What do you think is involved in Managing Others? How do you get good at it and how do you teach new supervisors how they can get good at it?